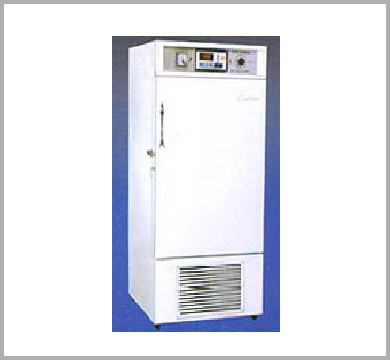 These cooling incubators are designed specially for close control of incubation / Storage temperatures. These are used for storage for BOD .tests, Storage of sensitive Cultures, Vaccines, etc.. culture of bacteris micro - organism & plantlife seed germination work, serum incubation studies & immunological work etc. Construction o fthe double wall the exterior is made os GI with powder coating flush Fitting insulated door has magnetic gasket, the inner chamber is made up of 304 quality stainless steel. The plexiglas inner door makes it possible to inspect specimens without disturbing the temperature the shelf postion of trays is adjustable. A compartment is formed at the back of interior into which is fitted the refrigeration evaporator , heater & powerful Centrifugal forced air circulator for creating positive airflow through the incubator. A hermetically sealed compressor housed below the unit provides temperature below ambient ,built in safety PT -100 Sensor prevents damage to sample in case of temperature controller malfunctioning . All controls are mounted on the top of the unit for better viewing & controlling. A solid state temperature with digital & Pt-100 sensor. Amirco processor controller can be provided with cyclic digital timer as per the given order.